Its finally March Break, so I have sometime to relax and post! Something I haven't been able to do in a while. The weather is getting much nicer out, the snow has pretty much all melted, and the temperature is rising, which meant that I got to ditch my winter coat this week which was kind nice. I am excited to catch up on every one's blogs, as well as on my movie watching. Plus Gossip Girl is back on this week! I finally got a chance to go into American Apparel the other day to try stuff on, we just got one at the mall near us a few months ago. I didn't end up buying anything but I now have a super long wish list. I love their cardigans, they are super soft. There is this Canadian Designer Hoakon/Helga, and they have really cute bags. The bags are all made out of recycled leather. I love their photo shoots. Here are some of my favourites. But check them out here. The Figure Skating Worlds are coming up soon. (March 22 -29) They should be really exciting and I can't wait to watch them. I want to wish everyone good luck, especially the Canadians. Hopefully we will bring home some medals. The first bag is wonderful. I am so looking forward to when I finish my research paper and can just focus on relaxing. Those pictures are amazing. A tad reminiscent of Erin Fetherston, yet it's so different. I love. 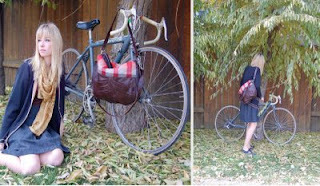 OH GOSH, way to go Belle, a Canadian bag designer that makes such amazing stuff? You just spent my paycheque for me! Haha. Seriously, I want them allll. I'm glad you're on break! Hope there's not snow up your way like there is here... I seriously thought we'd have spring for a bit. Thank you so much for your lovely comment! I also love that part of the magazine, I just love interior decoration! 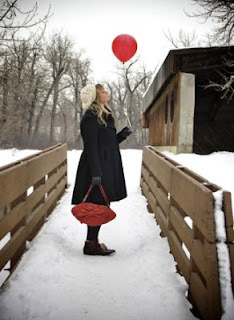 I love the picture with the balloon.